HERBERT HOOVER. 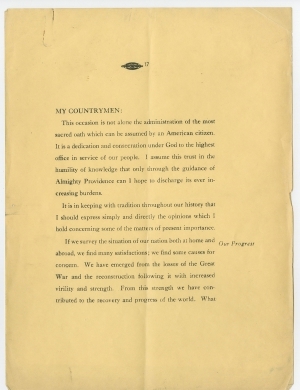 Printed Document Signed, March 4, 1929. 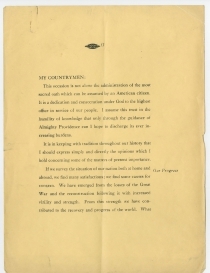 A rare large-print copy of his inaugural address. 21 pp., 9 x 12 in. Herbert Hoover won the 1928 presidential election to succeed Calvin Coolidge, who did not seek reelection. In a heavy turnout, Hoover received more votes than any presidential candidate before him. With 58% of the popular vote, Hoover carried forty states in the Electoral College, including his Democratic opponent Al Smith’s New York. Anti-Catholicism depleted Catholic Smith’s ranks, as did his opposition to prohibition and association with the corruption of Tammany Hall. 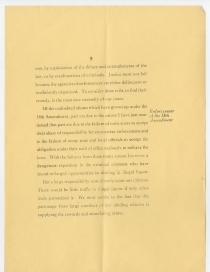 In this inaugural address, Hoover expresses much concern for law and order, and proposes a renovation of the criminal justice system and the more vigorous enforcement of prohibition. He rejoices in the prospects for peace in the world. He promises new attention to public education, public health, agricultural relief, and cooperation with business in economic growth. In the federal government, he seeks reorganization for effectiveness and economy in public expenditures. However, America was already facing economic turmoil, and in October fell into the Great Depression. 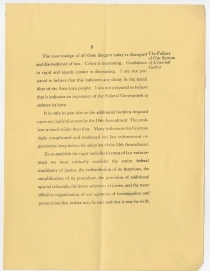 Although Hoover’s policies did not cause the Great Depression, people blamed Hoover for his perceived indifference to the suffering, and for not taking a more proactive role to aid the economy. His attempts to stimulate the economy and a few of the programs he introduced became key components of later relief efforts, but his response was constrained by his conservative political philosophy. He believed in a limited role for government and worried that excessive federal intervention posed a threat to capitalism and individualism. He believed in local, voluntary efforts to aid those in need, and he vetoed several bills that would have provided direct relief to struggling Americans. 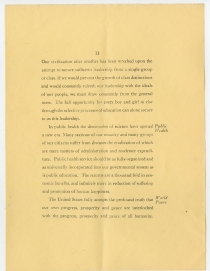 “Prosperity cannot be restored by raids upon the public Treasury,” he explained in his 1930 State of the Union address. 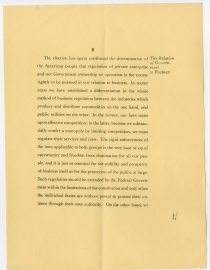 The public’s unhappiness with the eighteenth amendment and Hoover’s inability to combat the Great Depression resulted in his loss of the 1932 election to Franklin D. Roosevelt, in an almost mirror result of the 1928 election. Herbert Hoover (1874-1964) was born in Iowa into a Quaker family, but both of his parents died before he was ten years old. After living with relatives in Iowa and Oregon, Hoover became one of the first students to attend newly established Stanford University, from which he graduated in 1895. Hoover worked as a mining engineer in California, Australia, and China. He became an independent mining consultant in 1908 and traveled the world until the outbreak of World War I, building his reputation and fortune. When the war began, he helped organize the return of 120,000 Americans from Europe and spearheaded humanitarian relief efforts in Belgium, from his administrative base in London. After the United States entered the war, President Woodrow Wilson appointed Hoover to head the U.S. Food Administration. He lobbied for the job and agreed to accept no salary. After the war, the U.S. Food Administration became the American Relief Administration, which, at its height, fed 10.5 million people daily. Elected President of the United States in 1928, Hoover took office less than eight months before the Wall Street Crash of 1929 plunged the nation into the Great Depression. 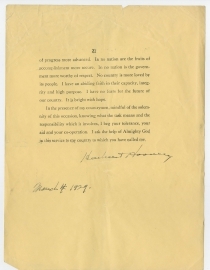 Franklin D. Roosevelt defeated Hoover’s 1932 bid for reelection.